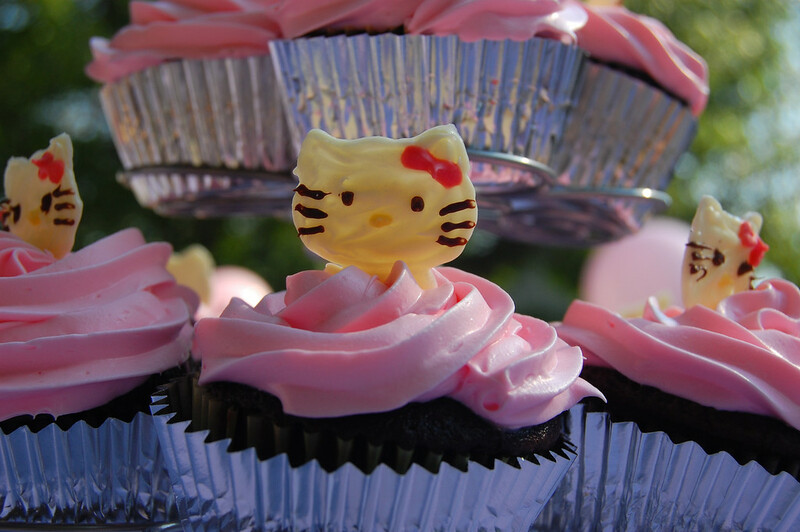 Some photos from the Hello Kitty birthday party several weekends ago. Only Emily among our three girls has a birthday in the warm part of the year, so we tried to keep as much of the party outdoors as we could. 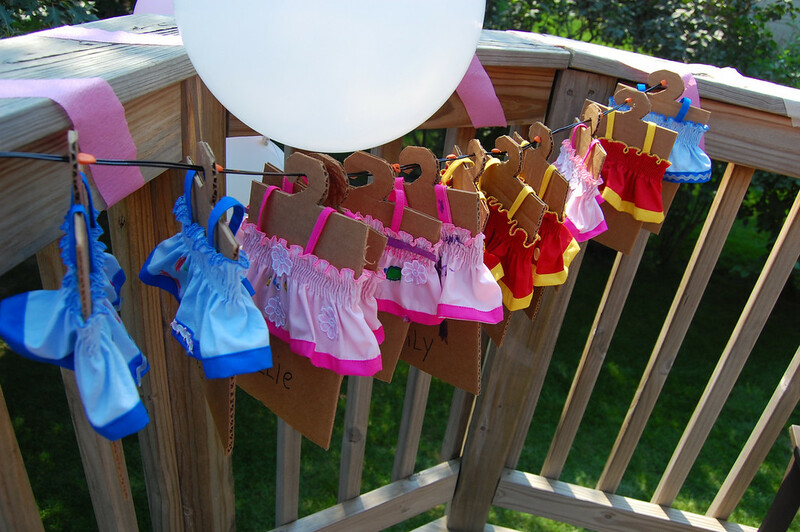 The kids arrived on our deck and picked a little dress on a cardboard hanger to embellish. 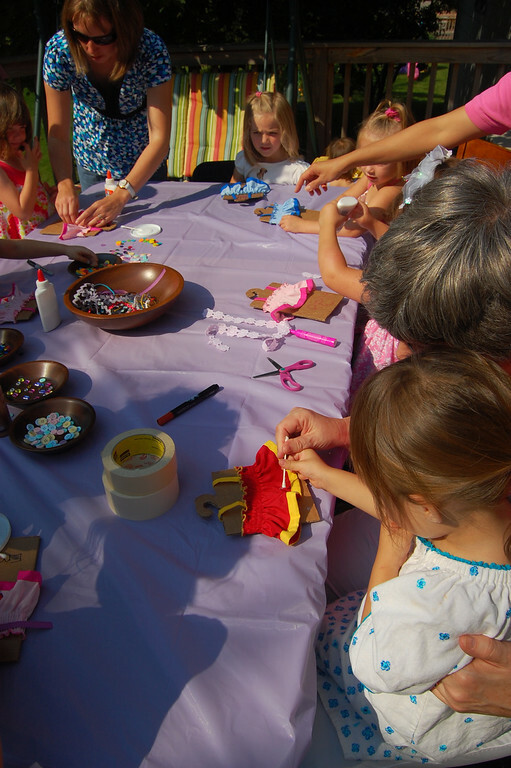 We set out buttons, ric-rac and other trims, adhesive gems, glue and fabric markers. The cardboard hanger helped keep glue and ink from soaking through to the other side of the dress. When they were done, the hangers were returned to the wire line to dry. 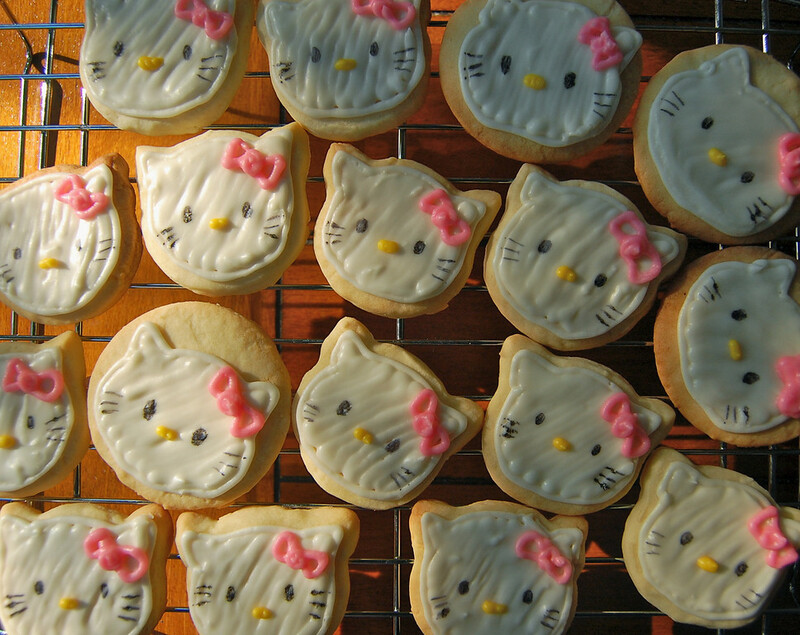 with white chocolate Hello Kitty toppers. These were made the same way as the Maisy ones here. 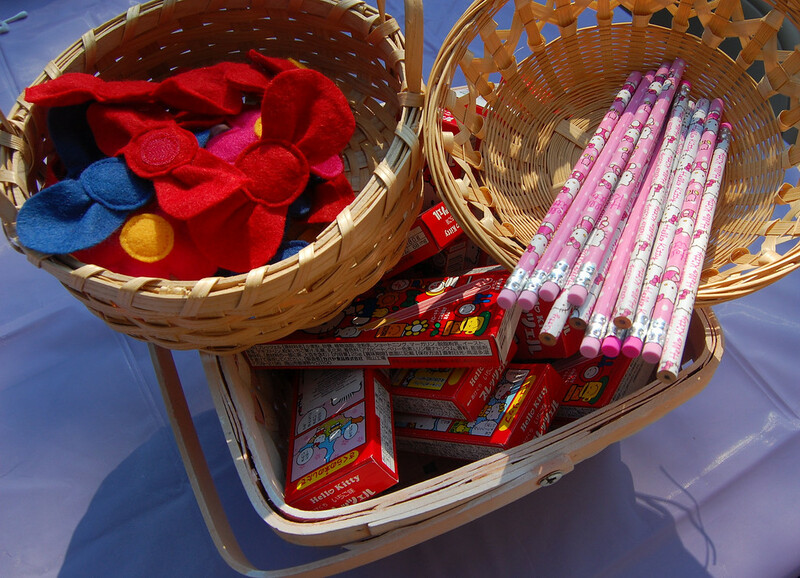 Prizes for games - HK pencils and HK strawberry cream-dipped cookie sticks (better known as Pocky). The third basket contains the bows and flowers for the softies which we put in the goody bags to match the dresses the girls picked earlier. 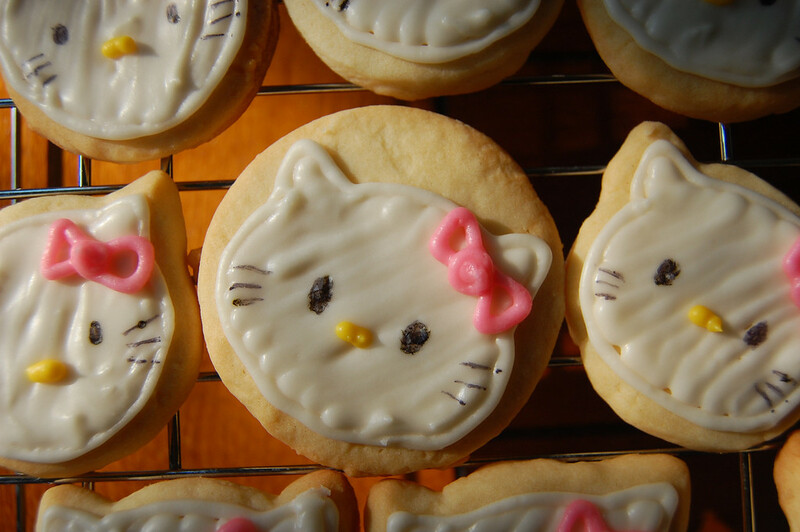 The games - first was the classic pin-the-bow-on-Hello-Kitty, made from the side of a cardboard box. Emily happily colored the bows - we made two because she couldn't decide between red and pink. 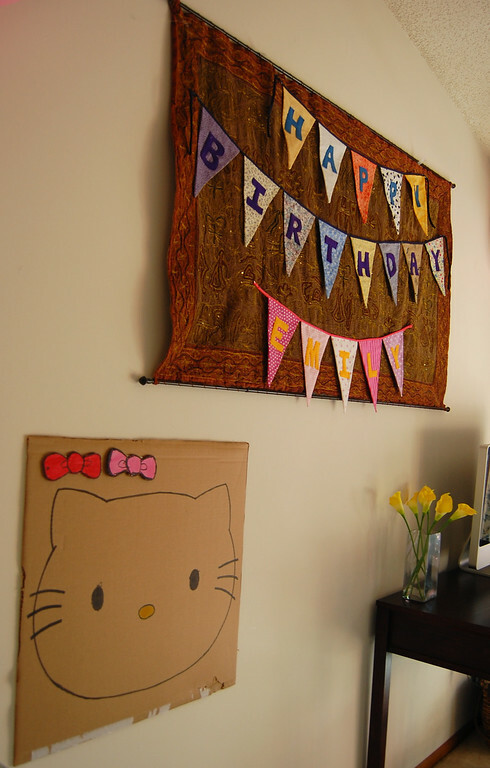 Check out the lovely banner made by my sister-in-law for Kate's birthday earlier this spring. 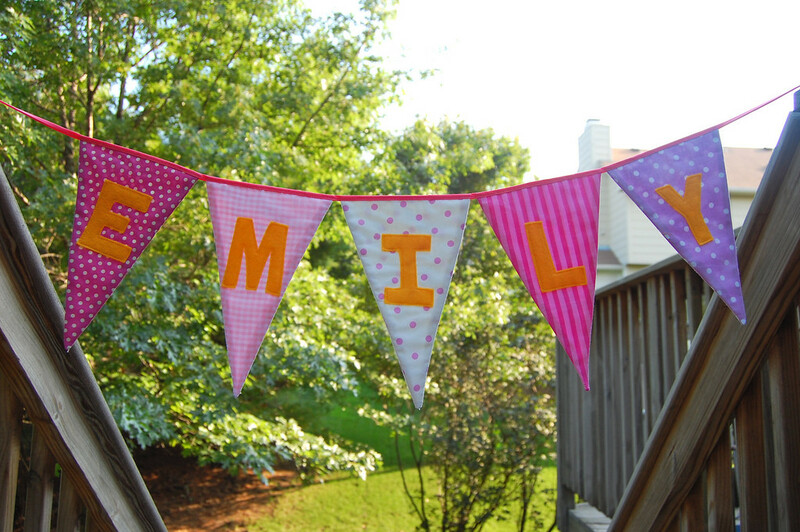 I made a (unmatching) banner with Emily's name and re-used it for this party. 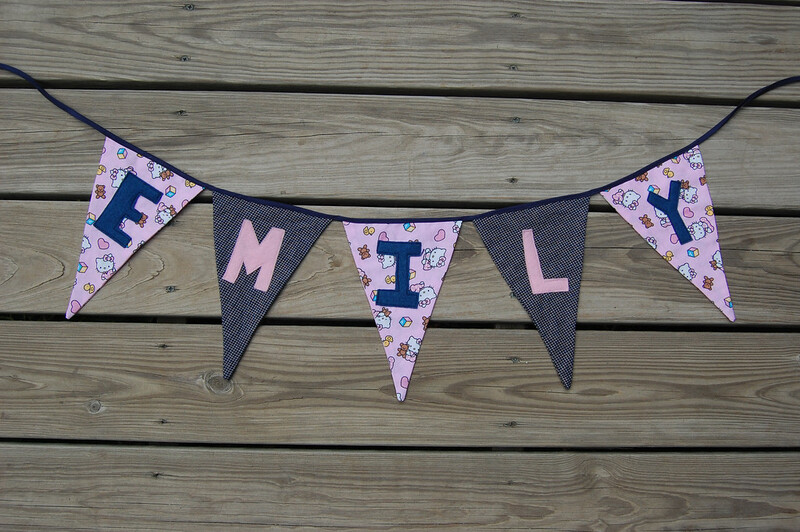 Unbeknownst to me, this same lovely sister-in-law made another EMILY one which arrived in the post after the party, and which matched the rest of the banner perfectly! 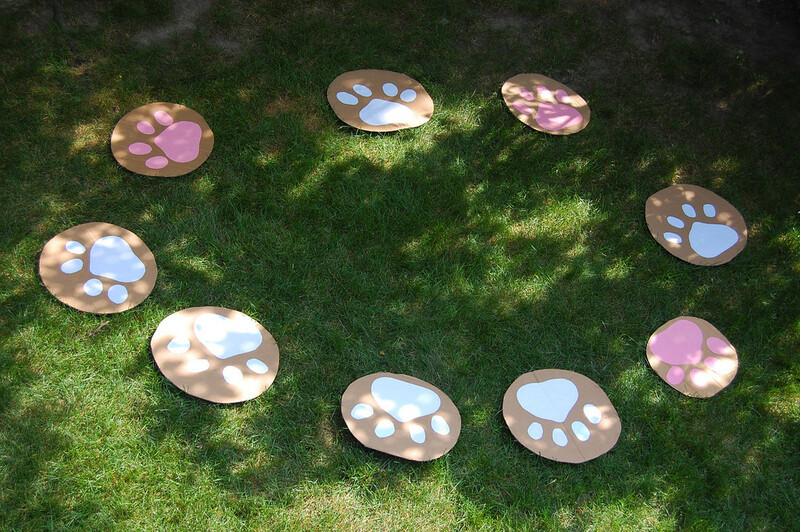 The second game was musical chairs, played on the grass with cardboard circles decorated with paper pawprints. Emily and Jenna made these with me. We love any reason to use cardboard! Here's our old friend: the papier mache pinata. After diligently ensuring that it would be strong enough to hold all that candy, I suddenly became terrified that it would never break and we'd be there whacking away till nightfall. I am pleased to report, however, that it fell apart perfectly, thanks to some very good slugging by the kids. 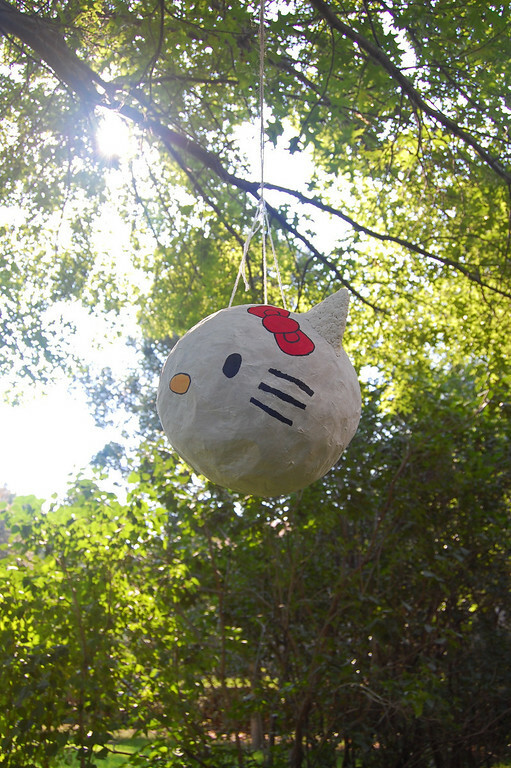 While the kids were swinging away, Grandma was commissioned to hide the 10 Hello Kitties all over the backyard. 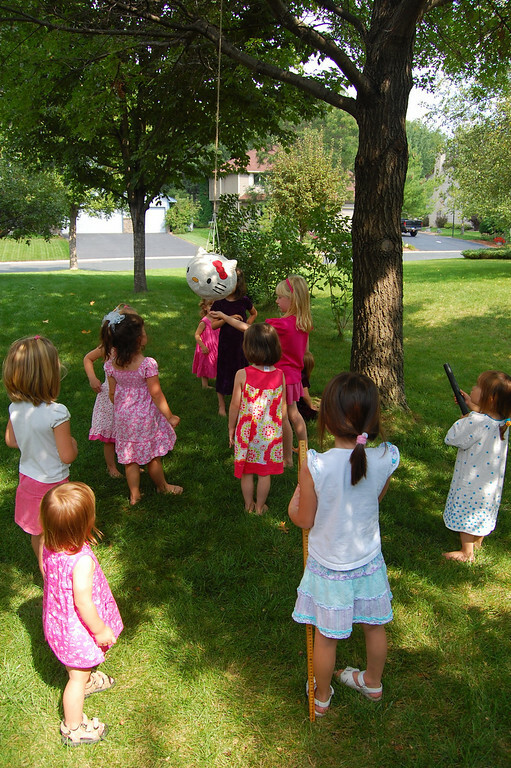 When the kids had collected all the candy from the fallen pinata, they were sent on a treasure hunt, each to claim her own Hello Kitty. Since they had no idea they would be searching for a softie, one little guest squatted by the side of our house and tentatively dug a finger in the mulch! She was quickly redirected to a white face peeking out from a fork in a tree. 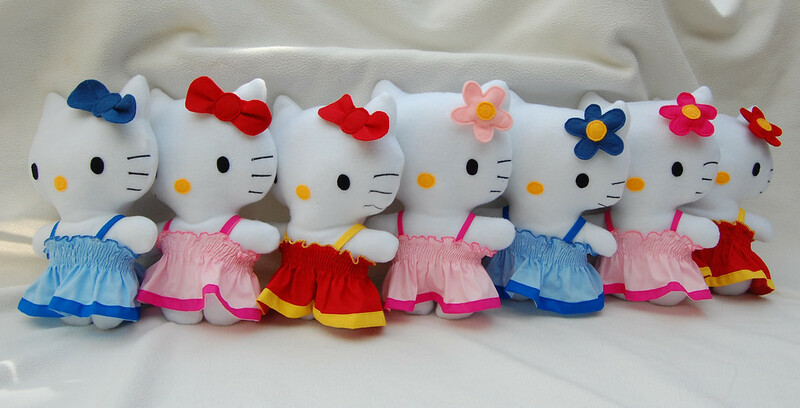 So 8 of the 10 Hello Kitties have left for better homes in the kids' goody bags (or in their arms). Two remain with Emily and Jenna. Fun. Fun to watch the kids hugging their white softies at the end of the party. Fun to watch Emily and her friends enjoy each other. Fun to visit with the parents who came. Fun to have grandparents and good friends helping out. 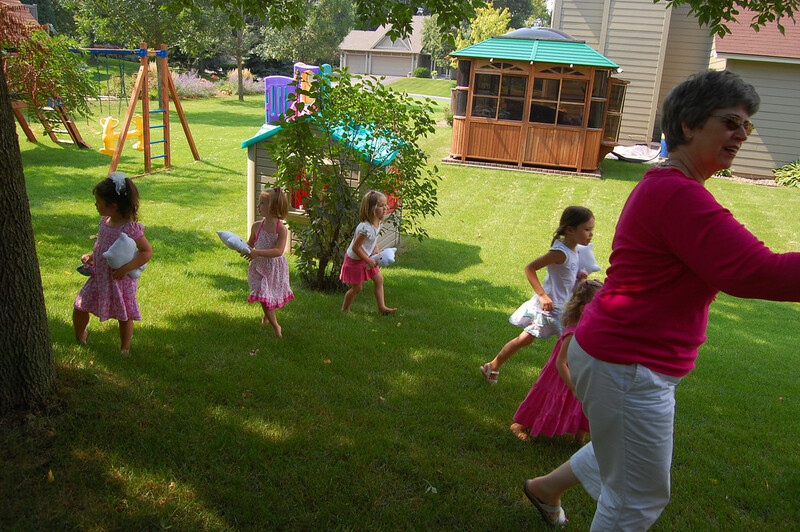 Fun to have the kids just play in our backyard as if the summer would never end. I think, though, that we had even more fun preparing for this party. I got to sew, play with cardboard, use my piping nozzles and bake. 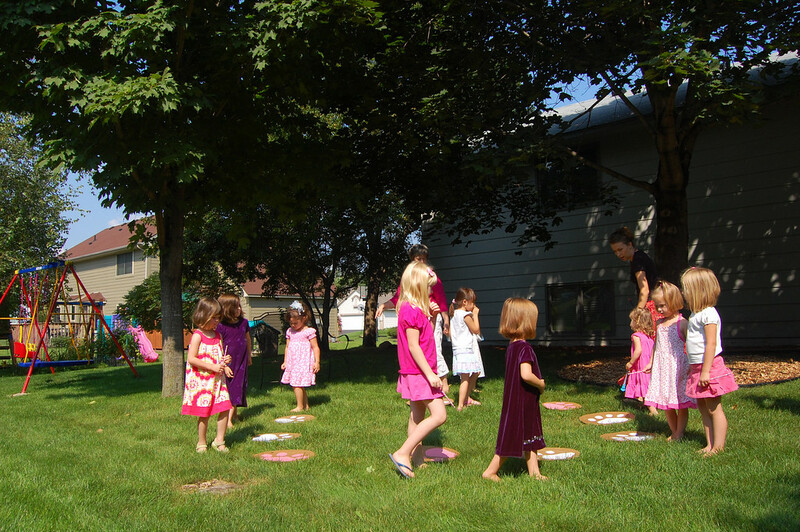 I love that Emily got to be so involved in every part of it, so that she really felt like it was her party, not just something her parents organized for her (although that might have been easier and less messy). 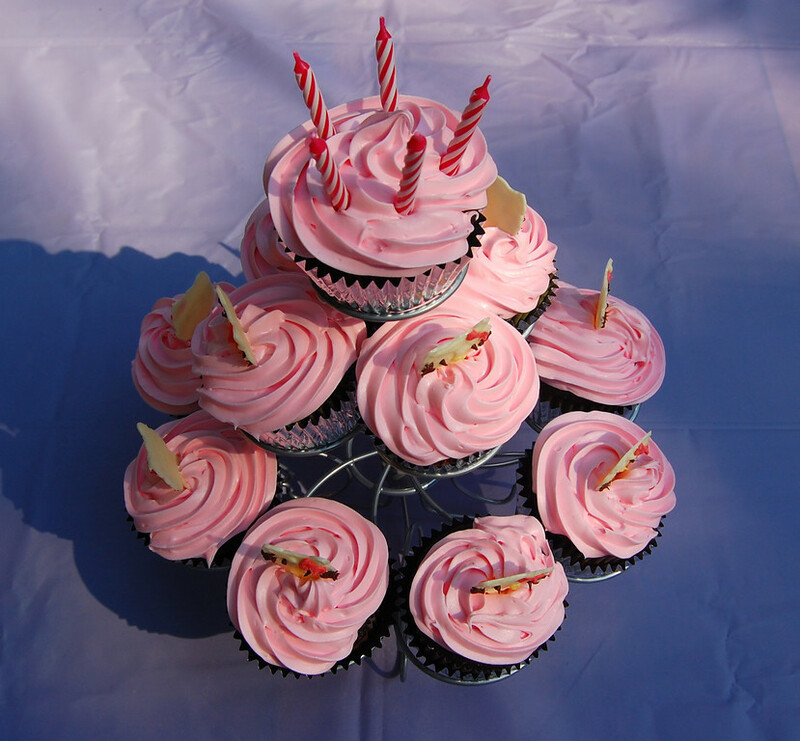 She learned new skills - like piping with a piping bag and nozzle and working with papier mache. Jenna and Kate also helped, and Jenna has declared she wants a "blue Hello Kitty party" in November. Help. But since she changes her mind every few days, it might be Strawberry Shortcake or Angelina Ballerina by the time her birthday actually arrives. 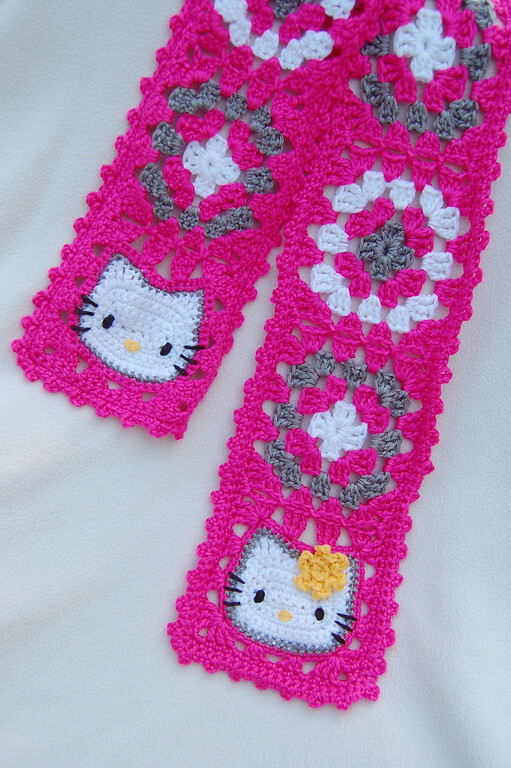 I leave you with a last Hello Kitty momento: this gorgeous scarf crocheted by the supremely talented Karin, whose three little girls were Emily's guests. What a super awesome party! Lots of effort and time has paid off in what looks like a fun fun fun day and lots of kids enjoying themselves. You always surprise me with ur creativeness and talent. very lucky girls u have. OMG that's totally awesome (the party) and that scarf is a masterpiece. I really enjoyed the pics in this post thanks. Wow! You really were a busy gal getting ready for the party! What a great job you did on all of the decorations, gifts, crafts etc..... What is it about little girls and Hello Kitty?! My 3 year old is gaga over Hello Kitty. Thank goodness for the Target $1 aisle! I agree that it so much more enriching for the kids when they help out (and enjoy) with the preps. What a fabulous party! She will remember that one for a lifetime. The scarf is just too cute. Wow you had a lot of work with the decorations and gifts and everything.Your Emily is so lucky that she has a mum like you!Thank you for the pictures! Lordy, you must've collapsed when that was over! That was intensely cute and beautiful. What an awesome mom you are! You should totally write kids' party books! What a fantastic party! 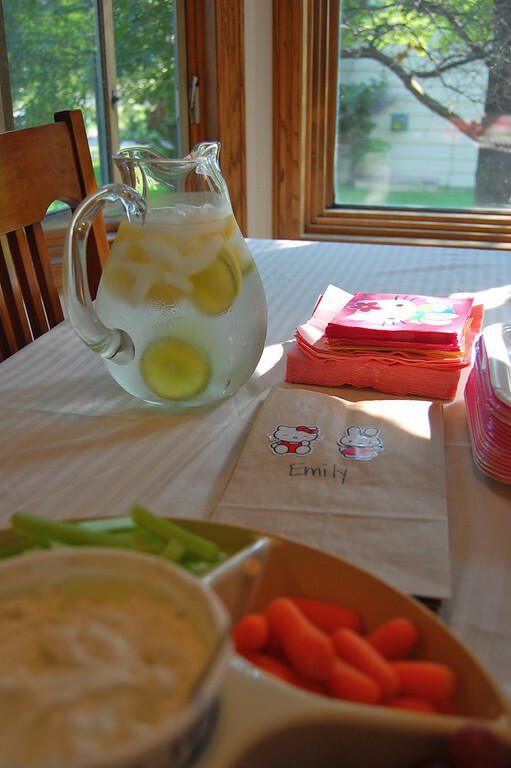 You have given me so much inspiration for my daughter's 4th birthday party! Sadly, her birthday is in February so we can't go outdoors (especially in FREEZING Massachusetts), but I'm feeling much more optimistic about my options after seeing this post. Thank you!!! It was such a fantastic party. And my girls are still clutching their Kitties as they go about the house or drift into sleep at night. You and your helpers created a really memorable experience! So glad we could be there with you to celebrate! This party is AMAZING! I love all the little details you thought of and the pinata turned out so well. That scarf is fantastic, what a wonderful gift. I agree with Katie, I'll be first in line for your party book! And I'd love to link to this party if you didn't mind. I hope you got a well-deserved post-party rest. Just looking at everything you managed to make makes me tired! Do you know, you've brought a tear to my eye! What an amazing party - I love the dress hangers, the little plushies, the sheer energy and creativeness you put into the whole thing! Your children are seriously blessed and MY children are NEVER going to read your blog!!! It looks like you had great weather for the bash! Wow, that's quite a scarf. And I see you didn't freehand your felt letters, he. 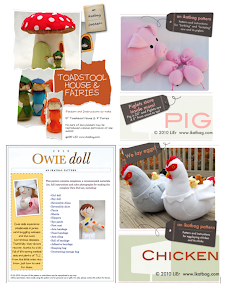 I bow down to your craftyness! It all looks so good! What a great party. Love your blog & THAT party! 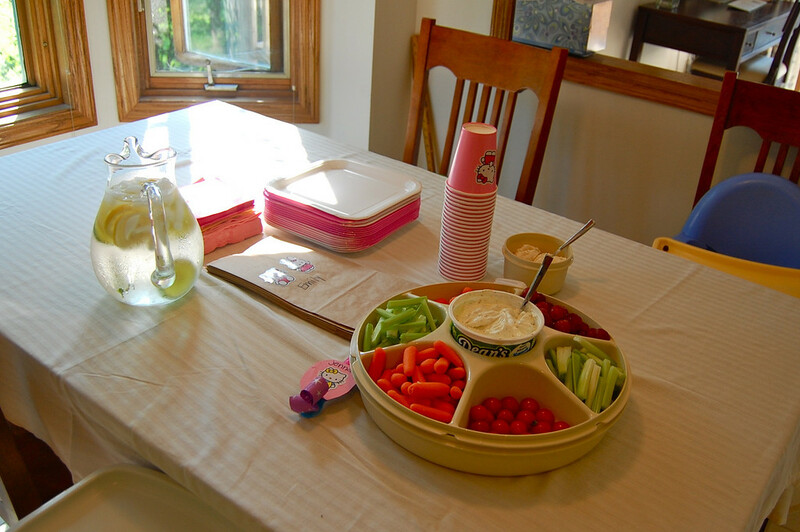 Great ideas for an amazing party! Would love to do something like that for my lil one! =) If I do, I will send pix! I'm sorry but that's just an insane amount of work. Adriana - isn't it? I thought so too. Until I looked at Emily having fun making alongside me. Made it all worth it. Thank you for posting this!! 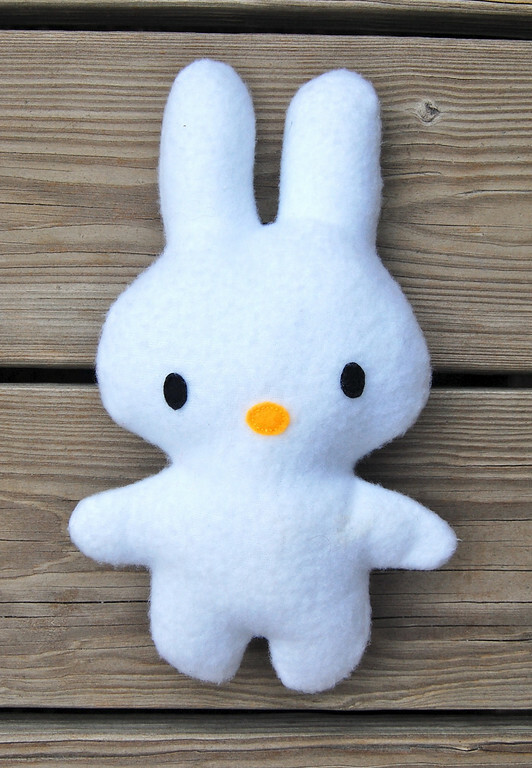 My daughter is having a HK party in a few weeks and we are doing the stuffed kitty craft!! Thanks for the idea!!! 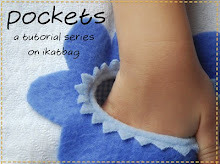 do you have a tutorial on the little dresses you made for the HK dolls? absolutely love that!!! thanks so much! Wow!! So many great ideas. You worked really hard. I am so inspired for my child's next birthday party now. I love the musical chairs with the footprints!! So cool.